Content caching is a macOS service that helps reduce Internet data usage and speed up software installation on Mac computers, iOS devices, and Apple TV. Content caching speeds up downloading of software distributed by Apple and data that users store in iCloud by saving content that local Mac computers, iOS devices, and Apple TV devices have already downloaded. The saved content is stored in a content cache on a Mac, and is available for other devices to retrieve without going out over the Internet. See the Apple Support article Content types that content caching supports in macOS. 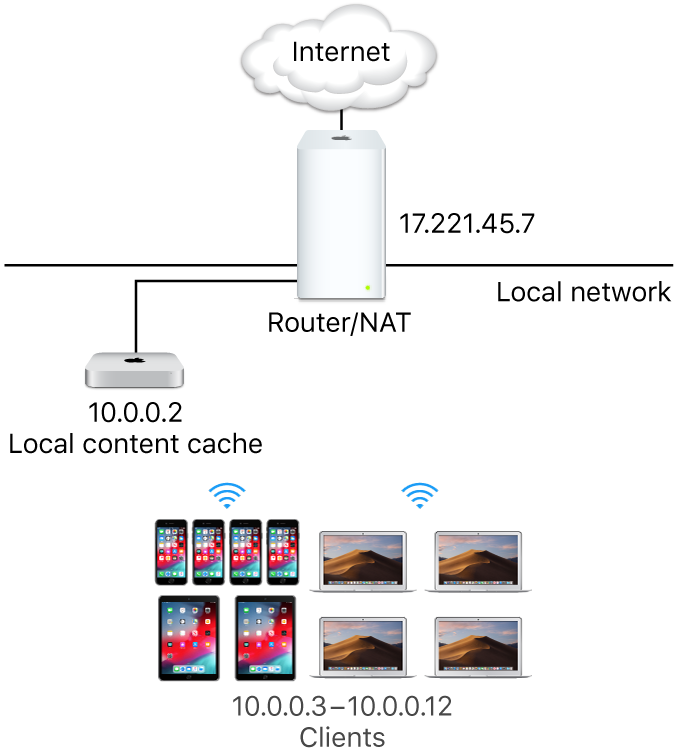 You can use content caching on networks consisting of a NAT environment for the content cache and all devices, or on networks consisting of publicly routable IP addresses. Apple devices with iOS 7 or later and OS X 10.8.2 or later automatically contact a nearby content cache without any configuration. Important: It’s strongly recommended that you set up content caching on a Mac that has a single wired Ethernet connection as its only connection to the network. 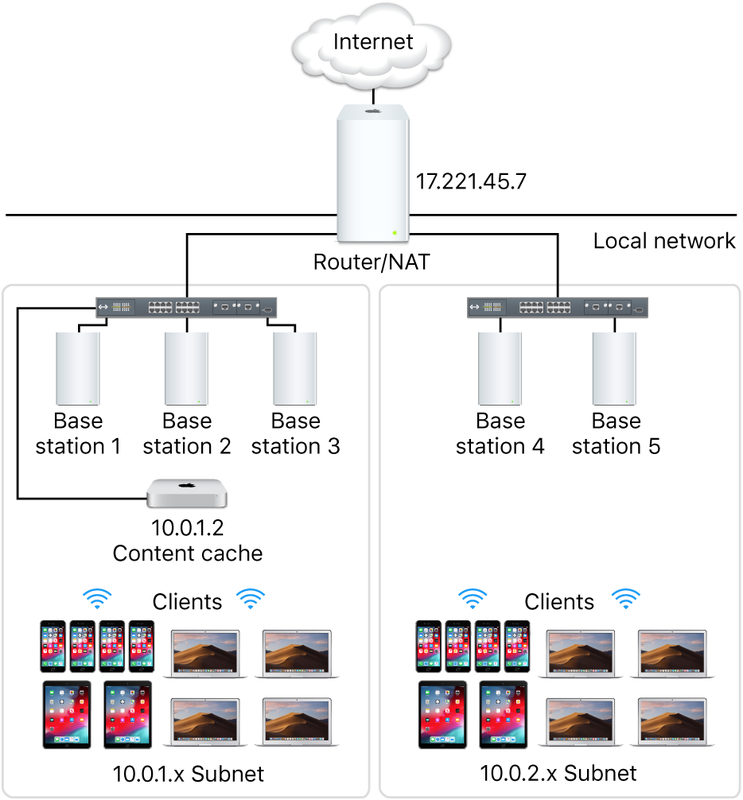 Content caching can use a Wi-Fi connection instead of Ethernet, but performance might be affected. After you enable content caching on a Mac, it keeps a copy of all content that local networked devices (called clients) download. Because the local network is normally much faster than the Internet, the second client (and all subsequent clients) download updates much faster. When your network has more than one content cache, they automatically become peers and can consult and share cached software. When a requested item isn’t available on a content cache, its peers are checked and, if the item is available, it’s downloaded. If it’s not available from a peer, the item is downloaded from a parent, if configured, or from Apple over the Internet. The right content cache is automatically selected by the client when more than one is available. See Set up content cache clients, peers, or parents on Mac. The default location for cached content is the boot volume. You can choose an alternate location and specify how much of the volume is used by content caching. When the disk space for the cached content reaches the maximum you specified, or when the available space on the volume runs low, the content cache deletes content that hasn’t been used recently to make space for the next request. How can I evaluate the performance of a content cache? You can use Activity Monitor to view content caching statistics. See View content caching logs and statistics on Mac. Content caching is primarily affected by two main factors: connectivity and hardware configurations. You get the best performance from your content cache by connecting it to your network using Gigabit Ethernet. The content cache can serve hundreds of clients concurrently, which can saturate a Gigabit Ethernet port. Therefore, in most small to medium scale deployments, the performance bottleneck is usually the bandwidth of your local network. To determine if your Mac is the performance bottleneck when a large number of clients are accessing the content cache simultaneously, check the processor usage for the AssetCache process in Activity Monitor (open Activity Monitor, choose View > All Processes, then click CPU). If the processor usage is constantly at or near the maximum, you may want to add additional content caches to distribute the requests across multiple computers. Also, if your Mac is in an environment where clients download large amounts of a wide variety of content, be sure to set the cache size limit high enough. This prevents the content cache from deleting cached data frequently, which may necessitate downloading the same content multiple times, thereby using more Internet bandwidth. Allow all Apple push notifications. Don’t use manual proxy settings. Don’t proxy client requests to content caches. Bypass proxy authentication for content caches.